Now and again, you&apos;ve got to push the ol&apos; envelope. You&apos;ve got to take a vessel you&apos;re testing offshore in edgy weather and really slam her around. 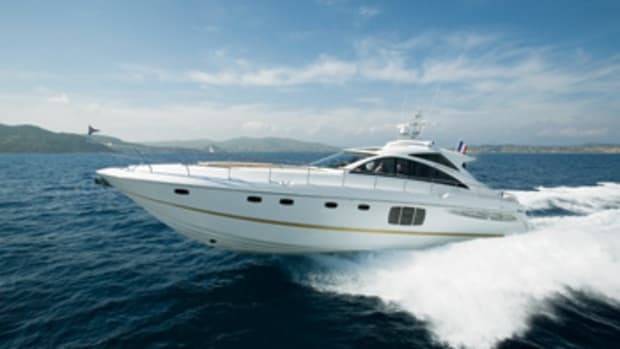 Of course, under such conditions, you hope for a good boat—or at least a safe boat—and prior to heading out, you like to know that everyone onboard is down with the upcoming vicissitudes. "You okay? You&apos;re not gonna get sick, are you?" yelled Jim Renfrow to the young fellow seated all alone in the U-shape lounge at the rear of the cockpit of our Fairline Targa 40 express. 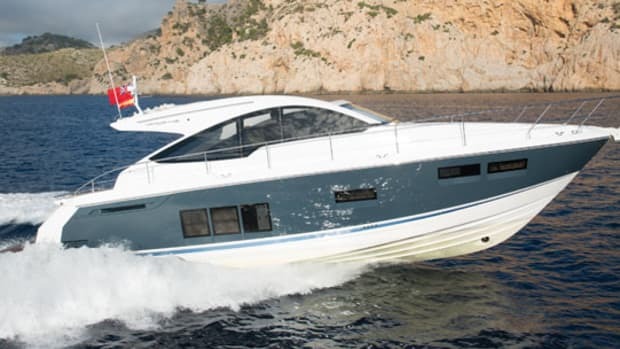 Renfrow is the sales honcho for Fairline of North America, stateside distributor for the cruisers and motoryachts built by Fairline in the U.K. The young fellow was a technowizard mechanic who&apos;d joined us to record fuel-burn data with a PDA-like gizmo he&apos;d attached with a long cord to one of our 303-bhp Volvo Penta D6-310/DP stern-drive diesel powerplants. We were just clearing Fort Lauderdale&apos;s jetties, and the trail ahead looked stark. Seas, I guessed, were running four to six. Winds were gusting to 24 mph or more. Squalls were squalling. And I was as intent on the technowizard&apos;s response as Renfrow presumably was. "Doin&apos; fine so far...just fine," he yelled back with cheery, thumbs-up enthusiasm. I gave Renfrow a vaguely collusive grin, aimed the bow of the Targa into a big headsea, eased the Volvo Penta electronic engine controls farther ahead, and thanked my lucky stars I&apos;d downed a half-tab of Dramamine an hour earlier. I&apos;ve been seafaring for 30 years now, but I still get queasy in stuff like this, at least at first. Whoeee! What a ride. The deep-V hull forms naval architect Bernard Olesinski draws for Fairline are justifiably renowned for their wave-chomping feistiness, and ours was a wave chomper of the first order. With the Targa&apos;s Duoprop drives trimmed up a tad, the mains turning 3000 rpm, and the Bennett flaps adjusted to compensate for wind-generated list, I quickly discovered I could bop around the Gulf Stream dodging rain squalls, doing around 35 mph, going up-sea, down-sea, and side-sea, with hellbent aplomb. Visibility from the helm was excellent. The power-assisted hydraulic steering was smooth. Hardly any spray came aboard, except upon one occasion when I inappropriately slacked off on the throttles, a move that doused us all with froth. The bolster stabilizing my stance was comfortable, if a little low for my 5&apos;11" frame. In fact, everything was percolating along quite nicely until I headed south to actually begin recording test numbers in the flatter, more top-hop-friendly waters prevailing in the lee of the jetties. Certainly, the 43-mph average WOT speed I was getting out of the Targa was both fun and impressive, and so were the tight, stern-drive-enlivened hard-over turns. But repetitively achieving these rousing parameters was a tad problematic for me, given the difficulties I was having tweaking the drive trim. Pushing the trim switches engendered no response from the digital readouts at times and delayed or exaggerated responses at others. 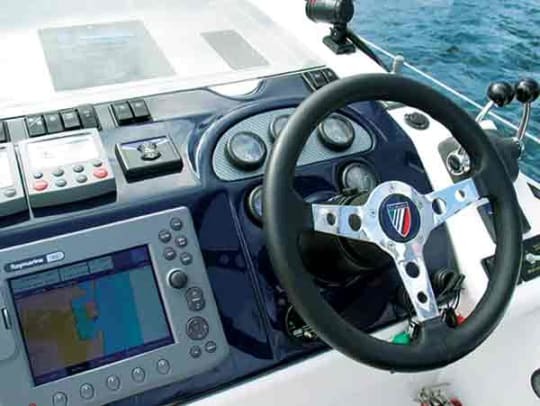 Either the Volvo Penta Electronic Vessel Control (EVC) trim switch on the dashboard was malfunctioning, or the EVC digital trim gauge was goofing up—exactly which I&apos;m not sure, but the upshot was I had to dial in drive trim intuitively. Fortunately, the rest of the trial was uneventful. And my dockside examination went mellifluously. I mean, we&apos;re talkin&apos; a nifty layout that includes two ample staterooms with standup headroom, a head with a separate stall shower, a galley chockablock with amenities, and a garage complete with an outboard-powered, standard nine-foot Fairline RIB, a set of easy-going rollers, and a remote-controlled electric Vetus winch to facilitate launches and retrievals. If all that and the 40&apos;s performance don&apos;t impress you, check out the price. 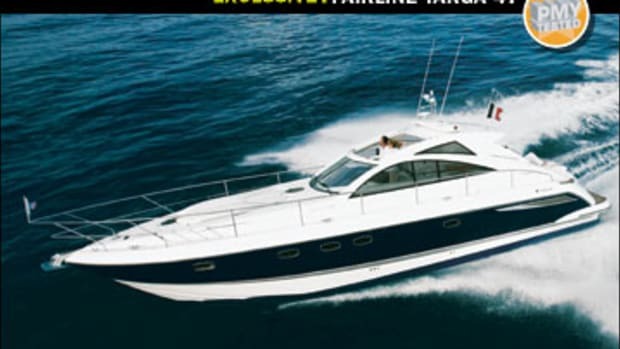 With Volvo Penta D6-310/DPs, our test boat cost $95,425 less than the basic Targa 40, despite the fact that she had numerous extras like a freshwater-flush MSD, Raymarine electronics, and a DeDietrich cockpit BBQ atop the wet bar. 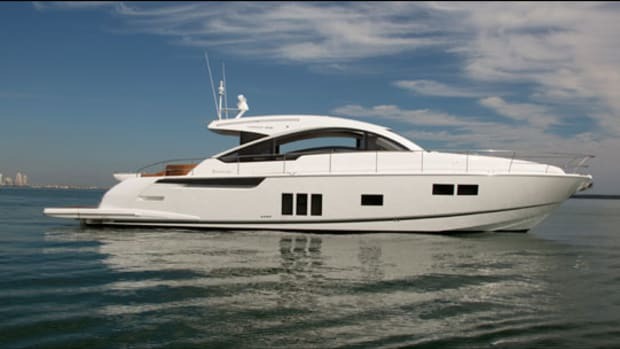 Why such a whopping more-boat-for-much-less-money scenario? 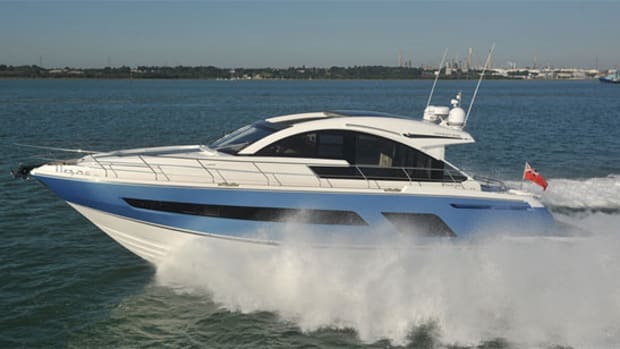 Renfrow says Fairline is exporting optioned-out, competitively priced 20th Anniversary Edition versions of the Targa 40 in hopes of getting Americans to buy smaller Fairlines now and larger ones down the road. And despite the bargain-basement price, our test boat&apos;s fit and finish was excellent. 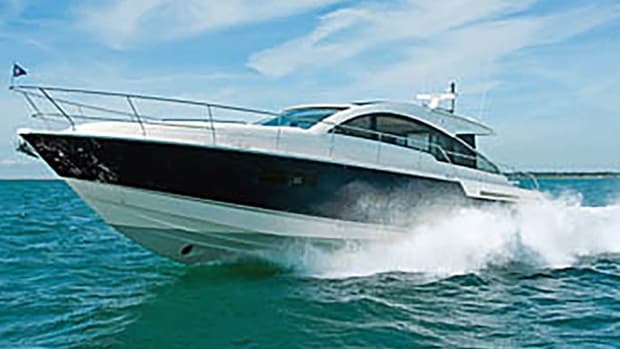 Her interior offered the same combination of expertly joined American cherry, high-end equipage, and savvy features you&apos;ll see on her larger sisterships. I especially liked the pull-out, extendable shelving under the countertop in the L-shape, starboard-side galley—the best under-counter, corner stowage I&apos;ve seen in a midrange galley. 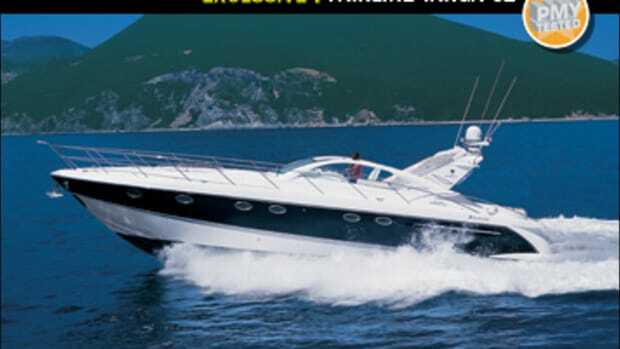 And I liked Fairline&apos;s lavish use of opening ports. 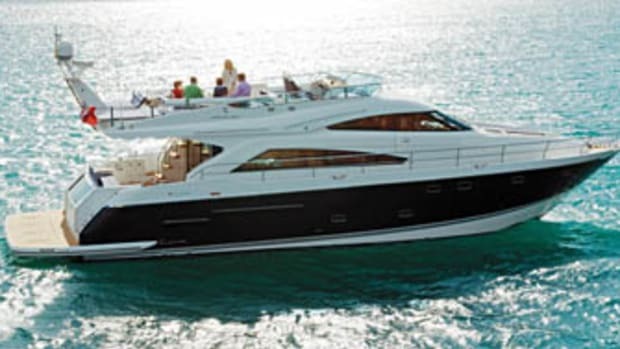 Whether in the forward stateroom, the after one, or the saloon/galley/dinette area, there are side-openers, skylights, and deck hatches galore providing cross ventilation and brightness. Things aren&apos;t quite so expansive in the Targa&apos;s machinery spaces. 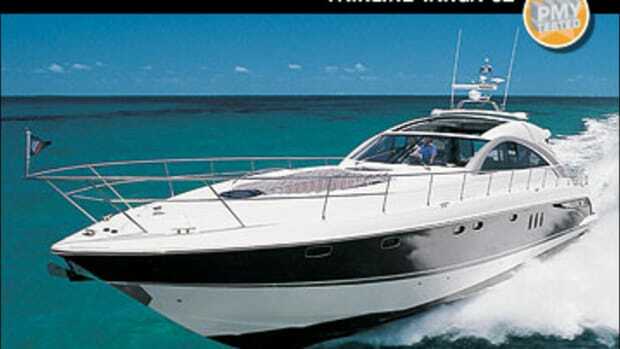 Transom access is excellent, but the engine room itself is crowded and offers only crouching headroom. Indeed, getting at the after half of the ER requires removing the RIB from the garage and extracting a bolted-down molded covering plate. And while one of our electro-hydraulic trim pumps was installed a good ways above the bottom of the boat, the other was on centerline and in the bilge, where salt water can get at it. A higher, bracket-type mount would be better. 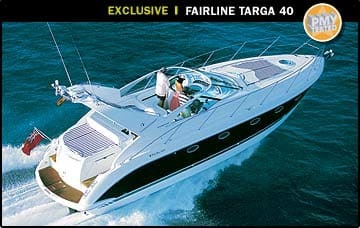 Still and all, I was favorably impressed with Fairline&apos;s 20th Anniversary Edition Targa 40. Notwithstanding her machinery spaces—a necessary tradeoff if you want a garage in a 40-footer—she&apos;s finely finished, artfully laid out, turnkey-equipped, and best of all, sweetly priced. Add Olesinski&apos;s proven seaworthy deep-V hull, and you&apos;ve got a fast, affordable, go-anywhere sort of family cruiser. Or, in the gleeful words of our young technowizard, who enjoyed his sea-trial ride immensely—and unproblematically, by the way—she&apos;s a real jewel.